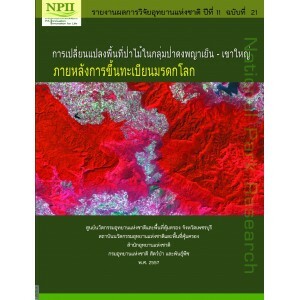 The study on Forest Conversion in Dong PhayaYen – Khaoyai Forest Complex world Heritage site was investigated by using LANDSAT satellite imagery. The classification of plant Community and other Land use patterns were analysed by comparing the imagery during 2006 and 2013. The result found that the plant communities in Dong PhayaYen – Khaoyai Forest Complex world Heritage site compose of Hill evergreen forest, Moist evergreen forest, Dry evergreen forest, Lower dry evergreen forest, Dry evergreen forest mixed with Bamboo, Mixed deciduous forest, Mixed deciduous on limestone, Dry dipterocarp forest, Secondary forest, Scrub forest, Range land, Government housing, Old clearing areas, Forest plantation, Abandon land or open area, Road, Water body, Agricultural land, Paddy field, Urban areas, Eucalyptus plantation and Para-rubber Plantation. The analysis found that several Ecosystems trend to be risk in forest conversion both positive and negative direction. According to the comparison of the forest conversion before and after inscription to World Heritage site, the analysis found that the direction of forest conversion is positive to Outstanding Universal Value (OUV) of the World Heritage criteria. Coincide with the core area, there is some old clearing area had been rehabilitated by forest Plantation Project with natural succession stage. Nevertheless, negative direction was occurred in area of edge and buffer zone of the protected areas and might not impact to the OUV of World Heritage site. Regarding to Land use forecasting undertake to the projection in next 20 years found that future scenario of land use changes in Dong PhayaYen – Khaoyai Forest Complex world Heritage site might have some small negative effected on OUV. However, the result of this study could be applied for land use planning in order to protect the natural World Heritage site in the future.